Voted Cigar Aficionado #10 Cigar of 2016! Wrapper: Honduran (Havana Seed). Filler: Honduran. Binder: Honduran. Country of Manufacture: Honduras. Factory Name: Honduras American Tabaco S.A., Cofradia, Honduras. -- The history: Punch has been a leading premium brand from Villazon Company ever since it was first imported from Honduras in 1969. A Cuban cigar manufacturer named Manuel Lopez created the original Punch cigar in 1840. In an effort to attract the British market, he named the cigar after Mr. Punch, the cantankerous half of the Punch and Judy puppet shows, which also inspired the name of the famous British humor magazine. Punch Gran Puro, introduced in 2003, expresses the heritage of Mr. Punch with an elegant domed medallion on the box that features a classic illustration of Mr. Punch and his dog Toby. The cigar: Punch Gran Puro is all-Honduran with an extra-dark, extra-bold Havana-seed wrapper developed exclusively for this cigar in the rich San Agustin Valley of Honduras. Both the wrapper and the binder leaves are sun-grown and carefully selected from the highest primings to ensure the cigars' special color and flavor. The result is the Puro of Puros -- a cigar impossible to imitate. 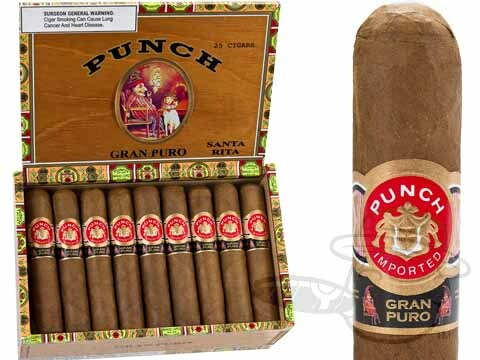 The experience: A new experience in smoking, Punch Gran Puro is pure Honduran, a medium-full bodied, no-nonsense cigar that would have brought a smile to the otherwise curmudgeonly face of Mr. Punch himself. These sticks are mellow, satisfying, and fragrant. Great product for a moderate price. Good appearance, the burn ran a little but quickly recovered about a third of the way in. Nice flavor at a reasonable price. I would order again..
Great cigar, becoming a regular item in my humidor. Punch Gran Puro Santa Rita is rated 4.5 out of 5 based on 5 customer ratings.